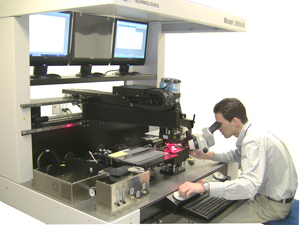 Palomar Technologies has a long history of serving the microelectronics and photonics markets and has provided high quality equipment and services to our customers for more than 20 years. As the industry advances, so do Palomar bonders as we strive to meet customer demands and provide the best ROI on your capital equipment investment. To ensure we provide systems, service, and support that meet our customers’ changing demands and offer the latest technology, we occasionally discontinue models and subsequently, support for those models. In many cases, obsolescence of parts and software dictate this action. Palomar is committed to continue servicing and supporting customers currently under a service contract for these models and to provide spare parts. Due to the lack of availability of some vendor supplied parts, however, we cannot guarantee availability of all spare parts. To ensure you have comprehensive parts availability, as well as the latest and most robust software for system stability and longevity, we highly recommend that customers with these models consider developing a transition plan to upgrade to the latest Palomar models. Please contact your Palomar sales representative with questions or to discuss an upgrade. We are grateful for your investment in Palomar systems and for your trust in us to provide the most efficient and effective device assembly solutions.